By way of a website survey, Polk Audio conducted extensive research about the general publics attitudes towards home theater. The conclusions were not all that surprising. Their respondents ranged from those who were confused on the subject and by the choices available to them, to those who were downright angry because they had not anticipated systems that would be so complex and difficult to use. The realization that there are legions of people put off by the whole home-theater concept led to the development of a new home-theater system, one that is affordable, easy to set up and easy to operate. The resultant product, and subject of this review, is the Polk RM Digital Solution-1 system (RMDS-1). This system is made up of a full-featured preamplifier (sans tone controls), AM/FM tuner, Dolby Digital processor, high-current six-channel power amplifier, five compact satellite speakers, and a 10" subwoofer. The RMDS-1 was designed to not only simplify matters for the masses, but also to offer performance that transcends the average home-theater-in-a-box. The entire system is offered at a price that represents real value. Everything you need for a home-theater experience is included; all that you need to provide is a TV and a source such as a hi-fi VCR, laserdisc or DVD player. Polk likes to think of the RMDS-1 as an "integrated separates" system because of the electronics used specifically for their speakers. All of the system components were designed at the same time using specially designed active crossovers, active equalization, and a proprietary Dolby Digital bass-management system. I attribute the better-than-usual integration between the tiny satellites and the subwoofer to the systems approach and active equalization. Generally speaking, in order for the woofer not to be heard as a separate source of sound, it is necessary to limit its use to about 100Hz and to send frequencies above that to the satellite. Unfortunately, the excursion required even at 100Hz is frequently beyond the capability of the tiny speaker. As a result, listeners are left with a gap between what they hear from the satellite and what they hear from the woofer. Polk uses active equalization and very steep high-pass filtering to fill that gap for a better blend between speaker and woofer. In addition, the RMDS-1's speakers are specially designed versions of Polk's RM Series satellites. All five satellites are timbre-matched for precise imaging and enveloping surround effects. Polk claims that the satellite enclosures are constructed of a polymer aggregate material "with the heft and acoustic properties of stone for stunning performance and looks." The speakers also feature 3.25" polymer composite cones and .75" soft-dome tweeters crossed over at 2.5 kHz with a 12dB slope. The center-channel speaker shares the same tweeter but uses two of the 3.25" cone drivers. The subwoofer features a 10" polypropylene cone driver and Polk's patented Power Port venting system. It is said to lower air turbulence at the mouth of the port for greater bass output with reduced port noise and distortion. Polk claims that the RMDS-1 electronics package should not be compared to receivers but to high-end separate components. This is as true of the multichannel amplifier as it is of the preamp/processor which, according to Polk, has been specifically designed for maximum performance within the Polk RMDS-1 system. I can personally attest to the fact that the electronics packed inside of the subwoofer unit would pack a rack-mountable chassis if they chose to remove it and market it that way. As it is, the electronics add to the weight of the subwoofer to create one uncomfortably heavy unit. I've taken apart my share of powered subwoofers, and I can tell you that I was seriously impressed by what I found inside the Polk sub. It is important to note here that the RMDS-1 system is simple from the standpoint of its interface with the user; it's extremely easy and foolproof to use. But that's not to say that it's a simple product. On the contrary, only a product with a very high degree of sophistication can be this easy to use and still provide a high level of performance. It is obvious that a lot of design work has gone into the creation of this system. I could spend the bulk of the review just commenting on Polk's stated design goals. However, it may be enough just to say that I think they met them, which is very good indeed. But to stay on topic, Ill move on to matters of practical importance. After using the RMDS-1 system for a couple months, I can assure you that it doesn't get much simpler than this. As a test, I unboxed the system, hooked it up, got it running, and completed the extremely minimal adjustments, all without ever opening the owner's manual. Connection between the preamp/controller and power amp (located inside subwoofer) is via an included four-meter, computer-style connector, and it could not have been simpler. All the other wires needed for connection are included and color-coded. Should you have special needs (longer speaker-wire runs, for example), there is no proprietary connection hardware required. Everything is standard-issue: spade lugs, five-way binding posts, etc. While I realize that I have set up more home theaters than most, I am not unaware that there are people out there who feel a bit squeamish about the prospect of attempting this on their own. If you fit this description, then I direct you to the large pictogram inside the box. This large diagram is probably much like the one that came inside the computer you are using right now. Using large, clear pictures and lots of color-coding, this very useful tool walks you through the steps required. Forget searching through pages and pages of an owner's manual; all you need is right here in black and white, and red, and green, and blue, etc. If you have already started your search for a theater system, you may have been to dealers and watched them sift through the pages and pages of OSD (on-screen display) via the remote control looking to adjust one performance parameter or another. Put that experience out of your mind. There are no embedded menus with the RMDS-1. Everything you need is contained on a single menu and is accessed by the 30-button remote control. Call up the menu on your TV screen and you can instantly see everything you may want to access. Buttons on the remote are logically arranged and of varying shapes to aid in their use under dimly lit conditions (although once the lights are dimmed, all you are likely to do is adjust system volume and, perhaps, bass level). Most likely, you won't even need to adjust the levels of the five matched speakers, but if you do, it's a simple matter of toggling down the menu, choosing the appropriate speaker from the list, and hitting one of two keys on the remote. Delay too is adjustable, but the likelihood of you needing to use it is rather remote; channel balance and time delay settings have been set at the factory to yield great sound in most rooms without user adjustment. The remote control offers you access to the source selection and "mute" as well as a late-night dynamic-range-compression system (on Dolby Digital material only), which limits the dynamic swings for lower-volume late-night viewing. In the mood for a little music? Select AM or FM from your listening chair and cycle through your station presets. From there you can even memorize those presets or just scan the dial! Or choose from any of the other available sources you may have available: the RMDS-1 has a host of inputs labeled CD, Tape, VCR, Cable/LD, DVD, AUX, DSS, DSS-digital and LD-RF. The RMDS-1 even has a built in demodulator so you can access Dolby Digital from your laserdisc player. Also included are optical and RF inputs, and multi-room/multi-source outputs. Forget about needlessly complicated and overabundant surround settings. Once the system is connected and running, after inserting a VCR tape, CD, LD or DVD, all you need to do is touch one button on the remote labeled "surround on/off." If you want surround, turn it on and the RMDS-1 automatically defaults to the highest level of processing available (DPL or Dolby Digital) -- no watching a movie encoded with Dolby Digital only to find the processor is set to DPL. If you don't want any surround at all, turn it all off. It's your choice. Whatever you choose, the front-panel display on the RMDS-1 clearly indicates what you have selected. The RM Digital Solution-1 is pre-optimized to achieve the best possible bass performance, which has been designed to match the RMDS-1 speakers. All you do is adjust the volume of the subwoofer to your taste -- again, via the remote. System power of greater than 500 Watts RMS into 4 Ohms, all channels driven. An 800- watt power transformer with separate windings for the high frequency and low frequency amplifiers to provide high current to the woofer and high voltage to the satellites. An independent power transformer for all protection and standby circuits to ensure that amplifier overload conditions will not affect the proper functioning of these critical operations. Three-stage protection circuit monitors DC voltage, speaker load (and shorts) and heat sink temperature. All channels are shut down if any of these parameters stray from optimum values. The amplifiers turn on and off when the preamp/processor is turned on or off. Optical couplers in the turn-on control circuits ensure "thump-free" turn on/off. Low noise, high slew rate, audiophile-grade op-amps are used in the preamplifiers. While the performance of the RMDS-1 system is very good (particularly on movies), it will shock no one when I say that it is not quite up to the standards set by several highly regarded and more expensive systems, including some produced by Polk Audio. But those concerned by these (to some people, almost insignificant) differences are not the individuals targeted by Polk for the RMDS-1. First, if you want higher performance, it is certainly out there, but be prepared for a marathon of shopping and the aggravation of mixing and matching components, all of which this system is designed to avoid. Certainly forget about simplicity of use, and the prospect of having a system that disappears into the room as well as this one and still maintains a generally high level of performance. Clearly the RMDS-1 system involves trade-offs, but Polk has designed a product with those compromises in mind, and it is preferred by a very large segment of the population. OK, so if the RMDS-1 isn't perfect, what could be better? Well, in a side-by-side comparison with my other systems (albeit much more expensive ones), the midrange is a little colored (for lack of a better word), a little "boxy," but not to such a degree that makes it unacceptable. Interestingly, this coloration is only a problem when listening to two-channel CDs. On the plus side, it's a very smooth system. While on paper the tweeter may not be the best in the Polk lineup, I was very happy with it. It never called attention to itself through excess sibilance, edge, or grain; rather, it sounded reasonably extended and even. On the whole, the midrange was clean and surprisingly transparent. Bass is perhaps the highlight of the system. It doesn't go as deep as some (Polk specs the system at 3dB at 38Hz), but what is there is very satisfying. It plays loudly and powerfully enough to satisfy all but the most bass-hungry among us. Quality of the bass is quite good too. In truth, it will probably fool a lot of people into thinking that it goes deeper than it does because most movie soundtracks don't contain bass information much below that anyway. 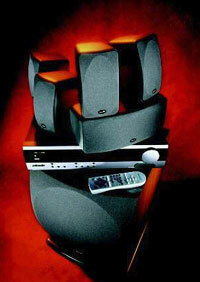 The fact is that after the comparisons are over and once the movie starts, the RMDS-1 system is eminently enjoyable. Dialogue is always intelligible, and the timbre-matched satellites do an excellent job of immersing listeners in music or surrounding them with effects. There is one caveat to all of the above, though, and this I am told by Polk will be changed in future production models. (My system is a pre-production sample.) As delivered, when left to the default settings, the gain on the subwoofer may be a couple dB too high. Rather than a sound that is too bass-heavy as one would expect, this has the effect of a tone control which has been rotated to attenuate the treble and tips the spectral balance too far toward the bass. However, it was easy enough to fix. I just went to the ultra-simple OSD and adjusted the level of the satellites up two or three steps across the board (turning down the sub didn't have the same effect). Then I told the machine to remember my settings, and that was it. After that, I didn't have to worry about it. It needs to be made clear, too, that the bass gain is not a problem in all rooms, and not all who hear it find the bass/timbre problematic -- some may love its added warmth. Rooms have a profound effect on bass, and they are all different. Frequently a problem like this can even be alleviated with a simple relocation of the subwoofer. No, no, it didn't freeze over because John Potis found a surround system to replace his two-channel music system; it's just the name of one of the music DVDs he used to audition the Polk RMDS-1 system, and it was a good one too! Over all, the Polk system did a more credible job reproducing music from DVDs encoded for 5.1 surround than from CDs. Two-channel music, while not bad, did not fare as well. Highs in particular were subject to occasional brightness, and I was occasionally reminded of that aforementioned boxy coloration (which oddly enough never manifested itself while listening in 5.1). But the Eagles' Hell Freezes Over DVD [Geffen ID5529EADVD] proved to be a very pleasant experience. The opening bass whacks from "Hotel California" were every bit as powerful and overblown as I have come to expect from both the DVD and the CD. Timothy B. Schmidt's bass guitar lines at the opening of "Help Me Through the Night" sounded very good too, possessing great power, articulation and detail. I could almost count the bass cycles. On both the CD and DVD, Don Henley's voice tends to be a little chesty and overly ripe and the Polk system gave it to me that way. All other vocals came through much the same way I've come to expect -- natural and clean. Guitars sounded very good and were as rich or as steely as intended. Again the sub proved itself one of the highlights of the system, and what a joy it was to be able to adjust its level from my listening chair (which I did when listening to music, adjusting it up about three notches from my movie setting). The DVD movie The Mummy and the RMDS-1 system combined to give me a completely satisfying cinematic experience. This movie has a superb soundtrack and it makes better use of 5.1 channels than any other movie that comes to mind. All the time spent underground in the caverns had the surrounds working overtime to reproduce copious amounts of echo, surround effects and action. The rock falls, explosions, gunfire, thunderstorms, bugs and wind all made up one exciting aural extravaganza. Bass effects ranged from the falling bookcases in the museum of antiquities to thunderstorms to the crashing of the bi-plane in the desert, and all effects were produced with the appropriate measure of bass slam. At no time was I subjected to excessive "boom" or monotonous one-note bass. Unlike with some inexpensive subwoofers (or maladjusted ones), every event possessed its own distinct sonic signature. Even after living with the RMDS-1 system for several weeks, the plane crash in particular surprised me with the subs ability to energize the room with real bass energy. The plane hit the desert floor with a real impressively room-shaking "thud." Dialogue intelligibility was excellent, and the system in general had a clean, crisp and energetic sound. On average, I seem to listen to movies much louder than I do music, and this movie was no exception. Over and over I found myself staring at the tiny satellites in complete amazement, not only because they were responsible for the high SPLs in my 15' by 20' room, but because they were doing it with absolutely no sign of strain. The truth is that I don't seem to be the type of person for whom the Polk RMDS-1 system was intended. I don't mind cluttering up my room with speakers and I think shopping around for gear is at least half the fun (I do, however, get as frustrated as many getting to know a new piece of AV gear!). But I really like this system. It's superbly engineered, easy to use, great looking, and does a very good job with movie soundtracks and 5.1-encoded music. For all that you get, I think it's a terrific value. Were it not for the fact that I need as flexible a system as possible for reviewing purposes, I would seriously consider this product for myself precisely because my wife is a member of that targeted market, and she deserves something this easy to use. After performance and ergonomics, what I find attractive about the system is the fact that it's so unobtrusive. Even the bass unit is smaller than many and the satellites are truly Lilliputian in scale and come with wall-mounting hardware. I can easily envision this system taking up residence alongside my two-channel music system in the same room. The system is so unassuming I could have my high-end stereo system alongside this theater system and one would never infringe on the freedom of the other. It will also make a great little second system for those who already have a full-blown, high-end theater system. Finally, unlike some systems, the more I play with the RMDS-1 system, the more I like it. As its novelty wears off and it becomes more and more familiar, I can forget about what a unique system it is and just power it up and enjoy a movie, and that's what it was supposed to be about in the first place. I can think of a lot of reasons why I'd like to own the Polk Audio RMDS-1. Check it out for yourself and see if you don't find a few too.